There were highlights aplenty as the Demons returned to the field for the second half of the Premier season, with our men making the perfect start to the New Year by taking out four wins over the Northcote Dragons. The Premier women’s 1sts followed up with a win on Sunday (the women’s 2nds resume next week). Our Shield team went down in a high scoring affair whilst the men’s Club XI teams split their results with a win and a loss. The 1sts win featured a superb unbeaten second wicket partnership of 195 between Meyrick Buchanan and Will Pucovski to chase down Northcote’s target of 251 for the loss of just one wicket. Meyrick finished undefeated on 121, his second century of the season, scored off 125 balls laced with 12 fours. Will’s 82 not out (126 balls, six 4s) was his fourth score over 71 in his five Premier hits this season. Earlier the Demons welcomed Chris Tremain (4/43) back into the bowling line up in one of his rare club appearances these days and, with his opening partner Zac Mevissen also taking four wickets, fought back to dismiss the Dragons for 251 when a greater tally appeared likely. The 2nds win was set up by the bowlers, where they combined to bowl Northcote out for 133. Pat Smith (2/16) grabbed the initial breakthrough before Kieran Elliott (3/29) followed with two more in his first spell and Sean Griffin (3/16) kept the wickets tumbling. Chris Anderson (30), Jackson Koop (42 n.o.) and Sam Brewin (34 n.o. ensured a seven wicket win with a bonus point. Charlie Holmes starred for the 3rd XI, belting 133 off 124 balls that included 11 fours and five 6s. Jonty Leadbeater (64) joined Charlie with the side in a spot of bother at 3 for 31 however they combined for a brilliant 204-run fourth wicket partnership, setting up a formidable 8/253. It was then the bowlers turn to dominate proceedings, knocking over the Dragons for just 92 in 32.2 overs. Glenn Hannah (2/9 off six overs) made a welcome return from injury and bowling partners Marcus Jackman (2/16), Will O’Brien (2/18) and Trent Thompson (3/17) gave the opposition little joy. The 4ths emerged victors in a very tight battle at Binnak Park. Josh Benson (32) continued his good form whilst Stewart McCooke (44) top scored in the middle order and Hugh Hyslop (20 n.o.) was handy late. The game ebbed and flowed in Northcote’s chase, having recovered from 4/52, 5/73 to 5 for 122. They needed a run a ball from the last four overs however with steady bowling, good fielding and a couple of run outs we prevailed by five runs. With all teams winning, we find all teams in the ‘eight’ ahead of next week’s final one-day round against Ringwood (1sts away). 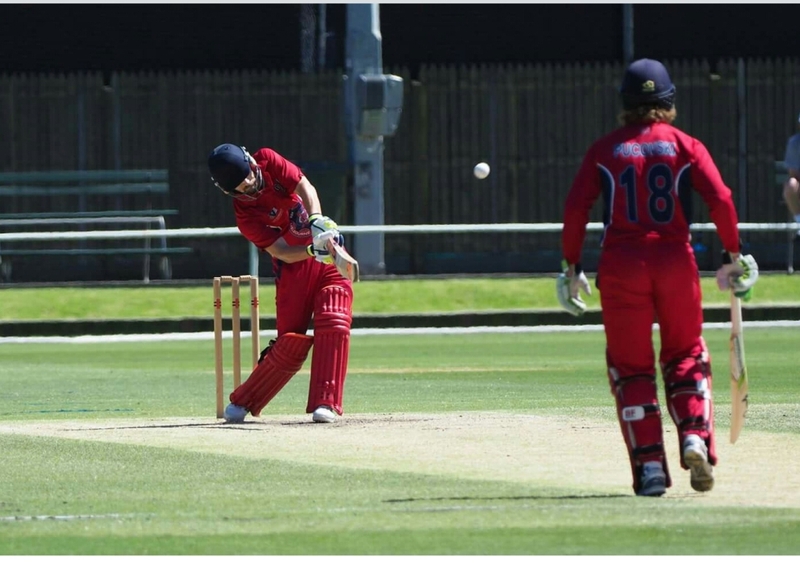 The women’s 1sts had a strong win in their T20 clash against Carlton-Brunswick. Amy Yates (65 off 35 balls, 12 fours) got her 2019 campaign off to a flier and, with support from Amy Vines (23) and Steph Townsend (26), the Demons posted 4/147. The attack, led by Elly Donald (2/18 off four overs) restricted the Blues to 5/111. With just one T20 remaining our 1sts can’t make the final, however the 2nds will claim a place with a win next week. Our Shield team ventured to Geelong where Charli Killen (59) opened up and top scored. Mia Perrin (30) did the next best as we made 7/164 off our 40 overs. Unfortunately this wasn’t quite enough as we were passed two down in the 32nd over. The men’s Club XI teams played a double header at the two Beaumaris ovals. Our no.1 side took on Melbourne High where an even batting display took us to 8/172 after our 40 overs. The bowlers got on top early and Tom Mellick chimed in with a handy 4 for 19 as Melbourne High comeback threatened. Unfortunately our no.2 side were on the wrong end of a couple of Northcote guys who plied their trade against us the previous day. One in particular must have seen what he liked at Beaumaris and in finishing 38 n.o. in the 3rds on Saturday he helped himself to 175 on Sunday. Their 2/341 proved a bit too much of a challenge.